Ever since we picked up Lords of Waterdeep, I feel like a lot of our more recent board game purchases have included a significant number of worker placement games. And this isn't a bad thing at all - worker placement is a fascinating game dynamic that really makes you think about each and every move you make in order to get the maximum benefit. Robinson Crusoe: Adventure on the Cursed Island is a little different since it's actually a cooperative game that utilizes the worker placement mechanic to some extent. Usually worker placement forces you to compete for slots in order to gain victory. This game uses the mechanic to stress how limited your movement options are and again it's important to make the most of every move. The game is rather brutal in terms of difficulty, which seems to be somewhat common among cooperative play games. And yet the design is compelling enough to make defeat a relatively fulfilling experience in the end. 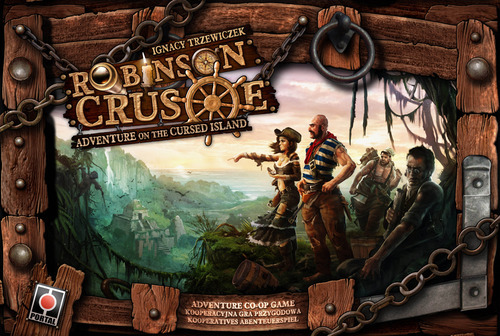 Robinson Crusoe: Adventure on the Cursed Island is a cooperative worker placement game designed by Ignacy Trzewiczek. The game supports 1-4 players and features six different scenarios that set your objectives for the game. Each of the players in the game take on one of four roles: the Carpenter, the Cook, the Explorer, and the Soldier (although this role only comes into play with the 4-player game). Each have special abilities that can help the group achieve success and slightly different health tracks that also have different effects on the game. As a nice bonus, the character cards present each of these roles as both male and female versions of the character, so you're free to choose the one that you best identify with. The goal will change based on the scenario, like the basic "Castaways" scenario requires players to build a signal fire to catch the attention of a passing ship. The game goes through several phases starting with an Event card (that is rarely good), checking Morale, and then resolving actions. And once the actions are done, production of resources happens, the weather screws us all up, and finally night falls. and during each phase, there seems to be a greater chance for things to get worse. Beyond the scenario objective, you also have to worry about a number of things including whether or not you have enough food to eat every night and whether or not you have an adequate shelter than can protect you from the weather and such. The key mechanic that players are responsible for involves their actions and each player has 2 actions to resolve. Possible actions tend to involve resolving an Event card, Hunting wild animals, Building something, Gathering resources, and Exploring the island. One can also try to improve Morale by essentially cleaning the camp or Rest in order to heal damage. But more often than not you'll end up Building, Gathering, or Exploring and this is where the most risk is as well. If you use both of your actions for any of those tasks, it is an automatic success. But if you spread out and only use 1 action for the task, then you will need to roll the dice to see what comes out. And there are three dice to roll - one determines victory or failure, the next determines if you draw a card or not (and again, they're rarely good), and finally one that determines whether or not you get hurt in the process. And that defines a lot of the game experience - deciding whether you want to devote all your actions to particular tasks in order to ensure success, or would it be better to spread out and get more done, but also risk more with the dice. And the cards that are draw are often added to the Event deck, which is a nice little game mechanic. For example, a Gathering card can talk about how that player ate some fruit on the way back. The card goes into the Events deck and when it does come up, that player will develop a stomach ache and will be unable to do anything for that turn. And so events don't just happen in isolation - they have a chance to progress, and so it feels like a developing narrative. And all that is pretty great given this is in fact a game based on a classic piece of literature. and the game used its Event game mechanic to tell that story and yet keep things pretty modular and random. Tie that with a brilliant game system with so many nuances (I haven't even gone into detail about weather and how to fight animals) and as a whole it's an amazing game experience. For folks who like TV shows like LOST or even Survivor, this is the game that really makes things feel real. And the game has a beautiful game board and an equally nice box design as well, at least for this Z-Man games version that we have. I really should take more time to talk about box design in future reviews. Robinson Crusoe: Adventure on the Cursed Island is competing with games like Pandemic for most brutal way to lose, and that's not a bad thing at all. The narrative aspect helps makes things feel like they're moving forward in their own way and the level of challenge is such that you'll want to try again despite losing to some freak storm or something. The game gets 5 actions you bleed out of the likes of Friday out of a possible 5.